The things we do for love. In this case, I found myself digging through the kitchen trash bin to figure out exactly how many lemons I used for this recipe. Thankfully it was a new bag, and the only items mingling about were a paper towel and rinds from the morning’s grapefruit. So why was I rifling through garbage to make this marmalade you’re wondering? People often ask how I create new recipes. There are many ways, but the most important advice I can give is get to know your ingredients. Tasting ingredients, both on their own, and in new and different combinations, is the best way to build your tastebuds’ memory files. As this catalog of flavors grows, so will your imagination as you stroll through grocery stores and farmers’ markets. I’ll elaborate more on this in an upcoming post for Eat, Write, Retreat. Have I told you I’ll be speaking at this food writing conference in D.C. this May? The panel is called Beyond Blog Your Blog and Shauna, Domenica, Pam, Jael and myself will be sharing our experiences and advice on nurturing your goals into reality. More on that later. Right now it’s time I tell you why my hands were wrist-deep in citrus rinds. My girlfriend recently gifted me with a bag of organic meyer lemons from her food co-op. She sweetly remembered I mentioned how expensive they were when I brought some of those brown butter pear meyer lemon muffins to school pick-up. Our daughters are best buds, so when Marina arrived for Ilana’s sleepover with Isabella, she came with a dozen meyer lemons. They sat on the counter for two days, and with the tropical temperatures in our extremely overheated brownstone, the window was closing on using them before they shriveled up. Then Olga came to the rescue. Do you know Olga and her blog Sassy Radish? 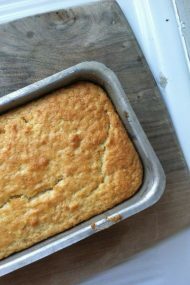 You should—it’s one of my favorites, and often I find we’re on similar wavelengths in the kitchen. 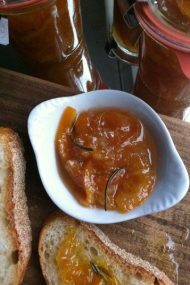 Well, she just posted a recipe for meyer lemon and blood orange marmalade which came from a recent Melissa Clark article. I just happened to read it at the very moment that my own meyer lemon situation seemed “do or die”. I decided to put my own spin on it and add some fresh ginger and mint. This has been my latest herbal infusion obsession since abstaining from coffee for the last two weeks (don’t ask, or we’ll never get to the recipe at hand). 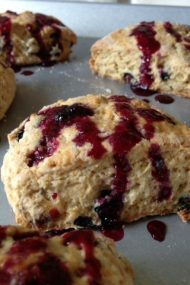 Once you read Olga’s post you’ll understand why my nightly tea routine inspired this flavor combination. And so, the reason I was digging through the trash is because in my eagerness to make this I just started cutting and slicing lemons without counting them. Once they were all sliced I realized I needed to know how many I used if any of us were going to make it again. I rolled up my sleeves, dug in and counted 16 ends that were cut off from the lemons. Since each lemon yielded two ends, that meant I had used eight in total. Why does this suddenly feel like an episode of CyberChase? As you may have guessed, there is no real method to my madness when it comes to developing recipes. It’s very primal and from the gut, so to speak. The kitchen is the one place I hope for the best but brace myself for disappointment, as happens to even the most seasoned cooks, whether they’re professionally trained or home afficianados. This time the result was a wonderfully perfumed citrus jam flecked with tender bits of candied ginger and a zing of mint. I don’t think I’ve posted a recipe this quickly—I just made it eight hours ago, but I figured what better way to celebrate the start of the weekend. In fact, I loved it so much, I made another batch, and swapped in ruby red grapefruit and fresh thyme. 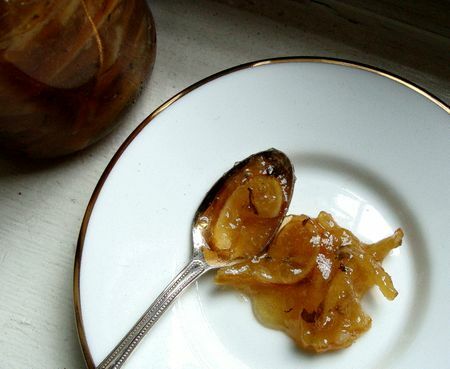 The best thing about making this marmalade was the sheer surprise that Isabella liked it. She has a fickle palate. Considering I’m just forging my own relationship with the floral note on these lemons, my heart really did skip a beat when her eyebrows tilted to the sky and a smile crept across her face. “It kind of tickles your tongue and has a sweet after taste”—her words, not mine, but we’re in total agreement. I’m always cautious with sugar, so rest assured I wouldn’t have you add this much to a recipe if I wasn’t convinced it needed it. I opted for 2 1/2 cups for a slightly bitter edge, but you might want to add that extra 1/2 cup if you prefer a more mellow sweetness. To prepare the lemons, cut off each of the ends. Slice the lemons in half lengthwise, and using a paring knife, remove the thick white membrane in the center. Use the tip of the knife to pick out the seeds and throw them away. Cut the lemon halves into very thin slices—you should have 3 cups of lemon slices (see Melissa’s tip if you have less). Add the lemons, ginger and water to a deep pot. Bring to a rolling boil over medium-high heat, and cook for 30 minutes until the rinds are very tender. Add a few splashes of water to the pot if the level falls too low and starts to dry up too much. Stir in the sugar and bring back to a boil. Reduce the heat to a simmer and let cook until it thickens and reaches 222ºF on an instant-read thermometer, about 35 minutes. Remove from heat and stir in the mint. Spoon the marmalade into clean, sterilzed jars and store in the refrigerator or process in a hot water bath for long term storage. Note: normally I’d let you know how long this will last in the fridge but since we’re both christening this recipe, I’ll have to keep you posted. I will say my friend gave us some lovely orange marmalade her mother made in France and it wasn’t processed in a hot water bath. None of us has died since eating it. This sound delicious — but where does come the ginger in the recipe? You probably forgot to mention it. JP: Yes Benedicte, in my rush to share this lovely recipe I forgot to mention it goes in the pot with lemons & sugar. I’ve adjusted the recipe now, and thanks for letting me know! Beautiful writing, photos, and recipe. Makes me wish (very much) to be in NYC with you and Olga this minute sharing food, catching up on life, and laughing are hearts out with each bite. J just begged me to make this for her ricotta cheese. And, she didn’t even know you tweeted about it last night! Love the spontaneity of this, Jennie–both in the writing and the recipe. 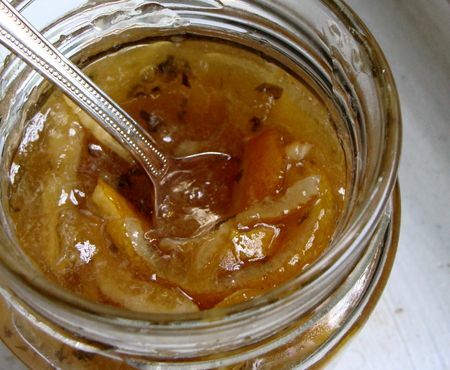 The marmalade sounds just right for late winter. And thank you for the shout-out. I am really looking forward to meeting you in May at Eat Write Retreat. I got teary eyed reading this… thanks… And it would be amazing if you, me, Alice and Gail all had some tea with this. I am looking forward to that day. Very interesting to get an insight on your thought processes in recipe development. Looks great! The grapefruit and thyme version sound incredible, although I do love ginger too! I can’t wait to hear what the shelf life on these are!